If you have additional questions about the claims process, please call the City Clerk’s office at City Hall at 251-649-8811. 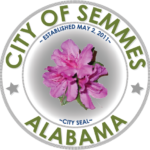 The completed form should be returned to Office of The City Clerk at City Hall, 7875 Moffett Road Semmes, Alabama 36575. No claim will be accepted without the required backup documentation. Once the claim is submitted, the claim will be turned over to the appropriate department for investigation. Once the investigation is completed, the claim will be presented to the City Council at the next available council meeting for their review and consideration. Council has the option of approving the claim, denying the claim, tabling the matter for further investigation, or referring the claim to another party/agency. If approved, the City will issue payment within 60 days. The claimant will be required to sign a release form before the payment is released. Most claims are paid within 4-6 weeks depending on the nature of the claim.